The layers section can be used to choose layers whose visibility should be controlled by DriveWorks. 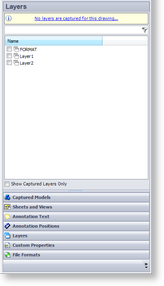 To capture a layer, check the box next to it in the list of layers. To uncapture a layer, uncheck the box next to it in the list of layers. If you uncapture a layer and save your group, the action cannot be undone. Furthermore, if you have already created any rules for the uncaptured layer, then they will be lost. Before uncapturing a layer, you may wish to make a copy of your group and projects.